An Iranian official has announced the allocation of $2.5 billion more for the country's military to increase what it terms the country's "military capabilities." Ali Asghar Yousefnejad, a member of Iranian Parliament and the spokesperson for Iran's special parliamentary committee that deals with the country's budget, told the country's official news agency IRNA on Tuesday that the $2.5 billion is in addition to what the military will receive once the fiscal year begins in March. 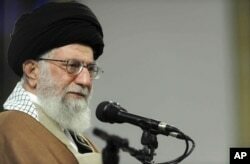 The country's Supreme Leader Ayatollah Ali Khamenei has reportedly approved the increase in military spending. In this picture released by official website of the office of the Iranian supreme leader, Supreme Leader Ayatollah Ali Khamenei attends a meeting with a group of Qom residents, in a mosque at his residence in Tehran, Jan. 9, 2018. The additional money comes from Iranian National Development Fund (INDF), a developmental fund established in 2011 that reserves a portion of the country's gas and oil revenues and spends it on projects that the government deems necessary. The increase in military expenditure comes on the heels of large-scale protests across major cities in Iran that continued for several weeks. Among other things, protesters criticized the government's economic policies and its military involvement in regional countries resulting in neglecting the well-being of its citizens. Some analysts believe Iran is spending big chunks of its military budget on foreign military interventions and adding to the military budget means more regime interventions in regional countries. "Huge amount of this budget will be spent for regional ambitions in Yemen, Syria, Lebanon and Palestine in support of Iran proxies," Babak Taghvaei, a Malta-based Iranian analyst told VOA. "Iran extends invaluable support to its allies including Hezbollah, Hamas, Houthis and other Shia militias in the region through various projects." In terms of how much the government spends to allegedly finance proxy wars in the region, Taghvaei said it is hard to come up with a number because the regime is secretive and denies it finances these regional wars. Alex Vatanka of the Washington-based Middle East Institute thinks the allocation of additional money for defense spending illustrates that the religious-based government is out of touch with ordinary Iranians. "Earmarking this fund a month after budget planning [for the] defense sector when people are dealing with real vital shortcomings and environmental issues shows how unrealistic and detached decision makers are in Iran," Vatanka said. 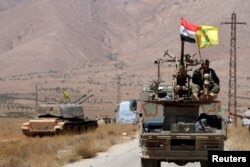 FILE - Hezbollah and Syrian flags flutter on a military vehicle in Western Qalamoun, Syria, Aug, 28, 2017. Tehran has reportedly spent billions in propping up its allies in Syria, Lebanon, the Gaza Strip, Yemen, Iraq, Bahrain and Saudi Arabia. Until November 2017 when it was replaced by North Korea, Iran topped the U.S State Department list of state sponsors of terrorism. "Iran continued its terrorist-related activity in 2016, including support for Hezbollah, Palestinian terrorist groups in Gaza, and various groups in Syria, Iraq, and throughout the Middle East," U.S. State Department said in its 2016 Country Report on Terrorism. "Iran used the Islamic Revolutionary Guard Corps Qods Force [IRGC-QF] to implement foreign policy goals, provide cover for intelligence operations, and create instability in the Middle East," the report said. Tehran denies the charges that it supports terrorism and that it has been engaged in proxy warfare in the region.